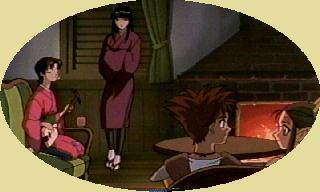 Yohrun, Erishisu, Fennis, and Sakura are sitting upstairs in the saloon by the fireplace, having tea. Fennis asks Yohrun what he knows about the Kamigari. He says he knows nothing, but why is she asking about such a thing. She says there were rumours about the Yurugaha military hunting for the Kamigari around Rubiedo. When he asks what the Kamigari is, Fennis declares that all she knows is what she read in a picture book when she was growing up. She goes on to tell part of the same story that we've seen Yorun being told by his mother in past episodes. The part where a god tries to divert the Kamigari by manifesting itself as a young girl, which he would be disinclined to destroy. This prompts a reaction from Erishisu. Elsewhere, three members of the council of 6 materialise above Spike and steer him toward Rubiedo. In Yurugaha, Agumaika confidently sets his coup de etat into motion. Back in the saloon, Sakura plays the shamisen and sings a song which reminds Yohrun of his mom. Erishisu tells him they're sure to meet her soon. Fennis asks if Oyaji is Yohruns father. She comments that he must be a mighty warrior to think he can take on the Yurgaha military assembled outside. Yohrun tells her not to worry, but grasps his sword as if he wants help in the fight. Fennis tells him he should not be eager to face the Yurugaha military. That the ningyo they use have souls extracted from humans. She knows this because her best friend was made into one of them. -FLASHBACK- Agumaika introduces Heiara and Vito to Fennis, placing them under her authority next month. The android Heiara says "pleased to meet you". -RETURN FROM FLASHBACK- Fennis descibes how the android is so much like Heiara, yet something is different. She hadn't realized at the time how important the difference was. As Yurugaha approaches, everything starts to shake from the magnetic turbulence. A table is knocked over and on the underside a message is found. Yoruns mother has been moved to a shed just 3 blocks away. One of the large goloms smashes the front of the saloon, and Yorun is almost stepped on. Fennis, Sakura, and Oyaji watch from the ruined second floor as Yohrun starts to invoke his kamigari power. His eyes start to light up but the force just fizzles and troops with rifles and bayonets charge. Heiara appears, dispatches some of the troops, and tells the commander that Fennis is a high ranking official of Yurugaha and they shouldn't have attacked the saloon. Yohrun and Erishisu run off to find Yohruns' mom while Oyaji and Heiara proceed to chop the giant goloms to pieces. Three members of the Yurugaha council materialize over the town. One of them captures Erishisu inside an energy bubble. Interleaved with this action are scenes in Yurgaha, where Agumaikas coup is not going well.